Aim. The aim of the work is to research the method of studying horizontal displacements in the channel of the Dniester river from town Galich to town Zalishchiki using topographic maps of different periods, special maps, and space images. Such an integrated approach of using various data for receiving input information about the river bed together with processing in ArcGIS made it possible to monitor the displacements of the channel, and to determine displacement values over a significant period of time. Soil maps and maps of Quaternary deposits are the basis for identifying the significant causes of the displacements of the channel. Method. The main reasons of displacements and meandering of the Dniester river bed were considered. The monitoring was carried out on the site (with a total length of about 100 km) from town Galich to town Zalishchiki for over a 100-years period. Materials for conducting research included topographic maps (1910, 1923, 1976) and space images obtained from satellites Landsat 5 (1986), Landsat 7 (2000) and Sentinel (2017), as well as special ground maps and maps of Quaternary deposits. The general workflow of data processing is presented and fragments of the channel of the Dniester river bed are shown, as vectorized topographic maps. Visualization and studies of changes in the Dniester river bed were carried out with ArcGIS 10.1 software. The sinuosity coefficients of the Dniester river channel were determined, and measurements of the maximum displacements of the river in its five selected fragments of the channel were performed. Measurements were made at selected points. At the same time, the area of the islands and the meanders were measured. DEM was created based on topographic maps with a scale of 1: 100000 for researching the reasons of river channels displacements. To determine the reasons which caused displacements, the boundaries of the Precarpathian bend and Podolsk-Volynsky hills are shown as their structures influence the formation of the character of the Dniester River bed. Maps of Quaternary deposits and soils have been analyzed. Results. The research area is characterized by a high rate of sinuosity coefficient with a significant number of meanders. The study of the displacements of the Dniester River indicates a significant meandering in the flat part and an almost unchanging nature of the channel in the hilly part. Hydrotechnical works, carried out in the 1920-80's, significantly reduced sinuosity and meandering, compared to the natural character of the channel in the 1910. The maximum displacement during the 100-year period is 900 meters. From the analysis of the soil maps and maps of the Quaternary sediments, it has been established that the places of maximum displacement of the channel are associated with the alluvial sediments in the 1st and, 3rd floodplain terraces in podzolic and marsh soils. Scientific novelty. It was established that the main effective method for forecasting channel changes is a hydrological and morphological analysis based on different topographical information, and information obtained on the basis of remote sensing data, which involves the combination and analysis of modern and past configurations of the river bed. The main factors of channel formation are: floods; lithological structure and hydrogeology; neotectonic movements; and the accumulation and erosion of sediment on the floodplain. Practical significance. The results of the monitoring of the deformation processes of the riverbed must be taken into account when solving a number of tasks related to the channel’s processes, in particular: designing and constructing hydrotechnical objects; designing power line locations within the transition area of the rivers; carrying out gas transportation networks routes; definition of flood zones and scales of destruction after flood phenomena; realization of recreational activity; establishment of boundaries of protected lands; and the study of the state of the border lands for the establishment of the border along the river fairway. 2. Burshtynska Kh., Movchko L., Shevchuk V. Monitoryng ruslovyh protsesiv ta povenevyh yavyshch riky Dnister za kosmichnymy zobrazhennyamy. [Monitoring of channel processes and high-flood phenomena of the Dniester River on the space images.] Modern achievements in geodetic science and production. Collection of scientific works. 2015, Vоl. I (29), pp. 124–128. 3. Burshtynska Kh., Tumska O., Lelukh D., 2000: Computer Technology of Determination of Area of Digital Eleva-tion Model. In:19th ISPRS Congress, Vol. XXXIII Work, Gr. IV, Amsterdam, pp. 148–153. 4. Galay V. I. Causes of riverbed degradation. Water Resources Researched, 1983, Vol. 9 (5), pp. 1057–1090. 5. Grenfell M. C. Mediative adjustment of river dynamics: The role of chute channels in tropical sand-bed meandering rivers. Sedimentary Geology, 2013. Available at: http://dx.doi.org/10.1016/j.sedgeo.2013.06.007. 6. Hamar J. and Sárkány-Kiss A. The Upper Tisa Valley. Preparatory Proposal for Ramsar Site Designation and an Ecological Background. Szeged. 1999, p. 502. 7. Hooke J. M. Changes in river meanders: a review of techniques and results of analyses Prog. Phys. Geogr., 8, 1984, pp. 473–508. 8. Hooke J. M. Hydromorphological adjustment in meandering river systems and the role of flood events. Sediment Dynamics and the Hydromorphology of Fluvial Systems (Proceedings of a symposium held in Dundee, UK, July 2006, IAHS Publ. 306. 9. Kravchuk YA. 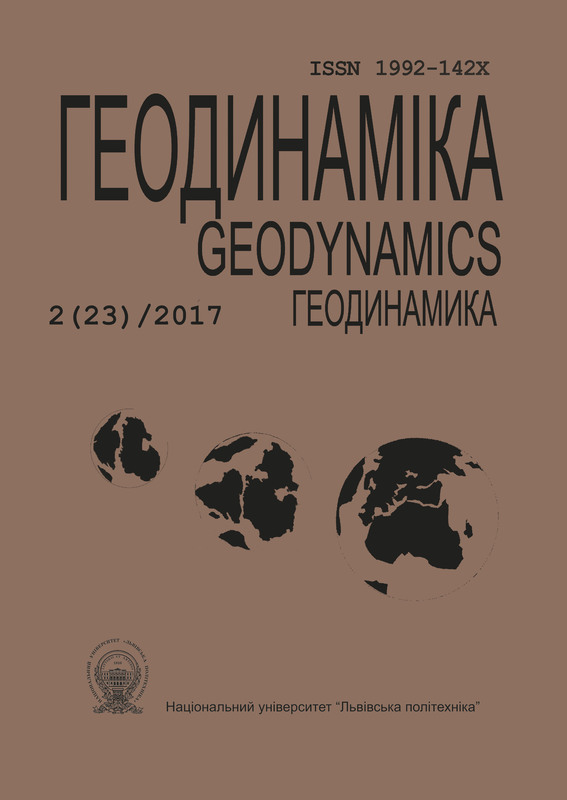 S. Heomorfolohiya Peredkarpattya [Geomorphology of Precarpathians]. Lviv: Merkator. 1999, 188 p.
10. Mahmood R., Babel Mukand S., JIA S. Assessment of temporal and spatial changes of future climate in the Jhe-lum river basin, Pakistan and India. Weather and Climate Extremes, 2015, 10, pp. 40–55. 13. Obodovsky O. G. Gidrologo-ekologichna otsinka ruslovyh protsesiv (na prykladi richok Ukrayiny) [Hydrological and ecological assessment of river processes (on the example of the rivers of Ukraine)], Kyiv: Ni-ka-Tsentr. 2001, p. 274. 14. Obodovsky O. G., V. V. Onyshchyk, O. E. Yaroshevych. Analiz ruslovyh protsesiv ta rekomendatsii shchodo upravlinnya ruslozaplavnym kompleksom na peredgirno-rivnynniy dilyantsi r. Tysy [Analysis of channel processes and recommendations for management of the river-flood complex on the foothill plain section Tysi.] Hydrology, hydrochemistry and hydroecology: scientific collection. 2005, Vol. 7, p. 69-88. 16. Rudʹko H. I., Petryshyn V. YU. Kharakterystyka rodovyshch valunno-hraviyno-pishchanykh porid u Lʹvivsʹkiy oblasti ta yikh vplyv na ekolohichnyy stan pryrodnoho seredovyshcha. [Characteristics of deposits of boulder-gravel-sandy rocks in the Lviv region and their impact on the ecological state of the environment.] Mineral Resources of Ukraine. 2014, Vol 1, pp. 39-47. 17. Shevchuk V. M., Burshtynska Kh. V. Metodyka monitoryngu rik na urbanizovanyh terytoriyah. [Monitoring method of the year in urbanized]. Geodesy, cartography and aerial photography. 2011, Vol. 75, pp. 73–82. 18. Zolezzi, G., R. Luchi, and M. Tubino. Modeling morphodynamic processes in meandering rivers with spatial width variations, Rev. Geophys., 2012, 50, RG4005, doi:10.1029/2012RG000392.